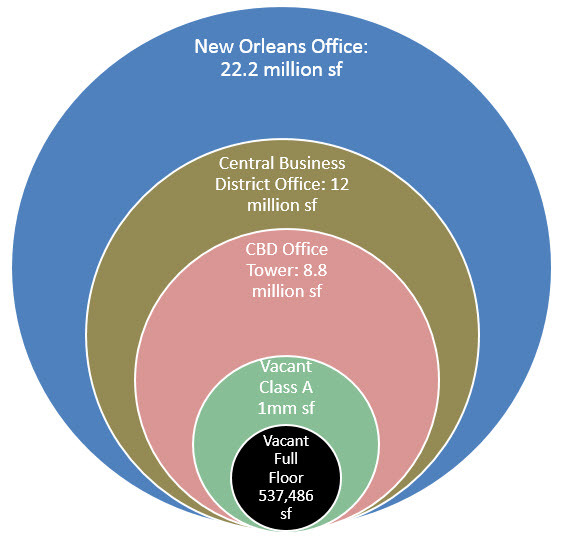 You might think taking 2 years to lease vacant office space is an outlier, an anomaly, or that something’s just wrong: like a building sitting on an earthquake fault; however, it’s just par for course for downtown New Orleans’ finest office towers where 78% of full floor offices have sat vacant for over one year, and 35% have sat for over 2 years, and 13% for over 4 years. And that’s just vacant time to date. Let’s step back and get an idea of the office market in New Orleans. There are 22.2 million square feet of rentable office space in the New Orleans market, with 70% of office space in buildings under 50,000 square feet. Of this, 12 million square feet of office space is in the Central Business District and, of this, 8.8 million rentable square feet comprises the CBD Class A Office Tower market and 1.6 million rentable square feet is Class B office space. Of this, approximately 1 million square feet of Class A office space is for lease and, of this, approximately 50% is full floor space. Full floors, if leased to a single tenant, only interest companies with at least 50 employees, which are in smaller supply than those with 5 to 10 employees, resulting in a longer lead time to lease larger office spaces. However, prices have not responded to a lack of supply since ownership of New Orleans Class A off tower buildings is an oligopoly. CBD Class A base rents have averaged $18 per square foot the last few years, resulting in many spaces having gone unleased for several years. Our forecast is for this vacancy rate to remain the same until prices adjust. 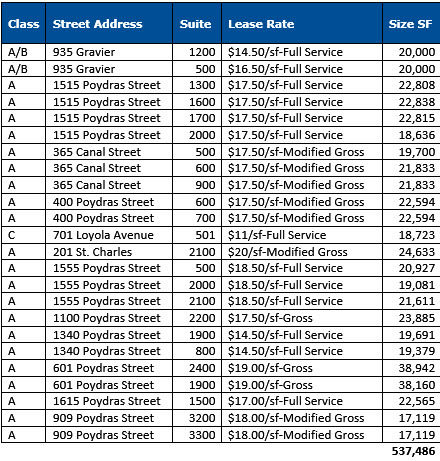 There are 12 Class A buildings in the New Orleans CBD with 24 Class A full floor spaces priced between $14.50 per square foot to $20.00 per square foot, and Class B/C office space available at $11 per square foot. Total full floor CBD office space is 537,486 square feet, and since our forecast is for only 100,000 square feet to be absorbed in 2015, it will take 5 years to lease the current supply. Owners of high vacancy office buildings will need to consider selling their property to redeploy assets to better performing categories, or reduce prices dramatically. The present value of $18 rent 5 years from now is $13.45 (assuming 6% opportunity cost), meaning that leasing space now at $13.45 PSF would be the same as receiving $18 PSF in 5 years. Large full floor office spaces have languished on the market but the smaller size office spaces are in big demand because of the shift that began decades ago in our economy away from oil and gas to tourism. It all started when we hosted a party and ended up with the 5th largest building in America. The party was the 1984 World’s Fair and the building was the convention center. Started by mayor Dutch Morial, the driver of the New Orleans economy has grown to 3,000,000 square feet since then. But there are other economic drivers such as digital media and movie production which do not yet have as much of an impact but are growing much faster. One of the latest economic drivers is the influx of entrepreneurs, pulled to New Orleans for its culture and tax incentives for corporations to employ here. These are the tax incentives which were just capped last Thursday, in a bill sponsored by Rep. Joel Robideaux from Lafayette. 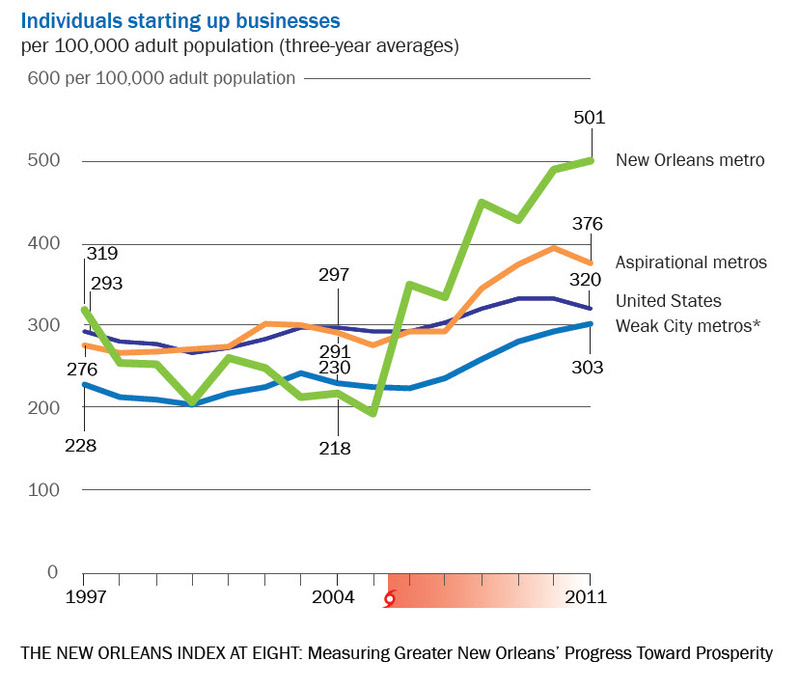 The influx of entrepreneurs is verified by research from The Data Center in their report, The New Orleans Index at Eight: Measuring Greater New Orleans’ Progress Toward Prosperity, which shows a dramatic increase in start-up businesses in the New Orleans area. 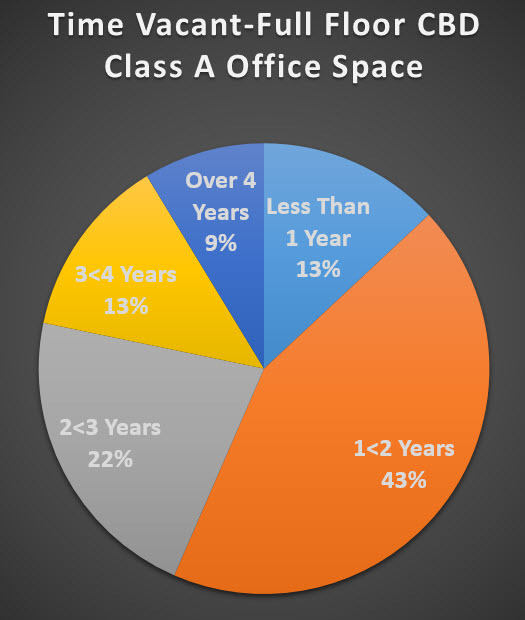 Start-ups tend to require smaller office space and are hesitant to sign long term leases, leading to demand for executive suites which offer month-to-month leasing including secretarial support, conference rooms and locations in Class A office space. Our forecast is for smaller office spaces to see an increase in demand while larger office spaces languish, dragging down performance which causes office buildings to come on the market. In summary, the large Class A office spaces are sitting on the market and will continue to sit until prices adjust, but the smaller office spaces are filling the void in demand for new business start-ups. Where one door closes, another one opens. Sources: LoopNet. LACDB, Emporis databases. GNO, Inc, The Data Center.